Sunday morning, right after the sun finally came up, I made it out to the Drive. 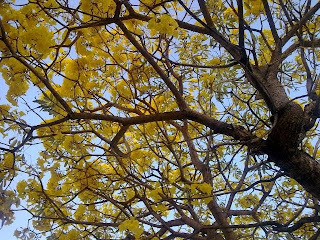 I was near the tail end of the dog walk for the day and I saw a massive pile of yellow flowers on the sidewalk. I found it amusing that in this little city, the rubbish on the sidewalk was flowers. Other cities it might not be so pleasant a pile but that is neither here nor there. When I got to the trunk of the tree, my dog decided that she needed to sniff the thing. She did it for a very long time, so I looked up and got this view. 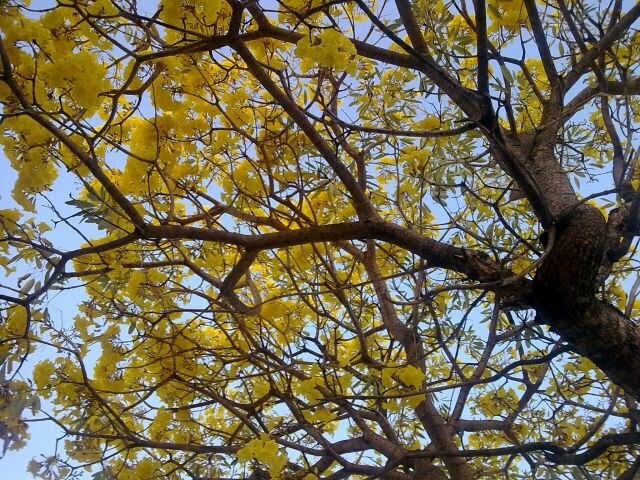 Beautiful tree that had the sky almost completely blotted out with yellow blooms. The blooms have all been fertilized on my citrus trees, the Mangos are starting to form on the tree near the house. This tree and the others like it have their time right now. For the meantime, I'll just enjoy them along the drive.